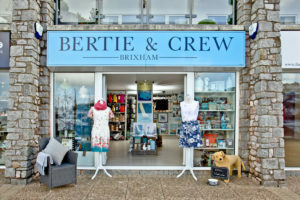 Bertie & Crew are offering up to 60% discount on many items in the store. Please don’t forget to take you FoBL Membership Card/ Loyalty Card with you. This month sees the culmination of our two-year lottery project in St Mary’s Churchyard – Cowtown 1850-1900. Almost without exception a group of volunteers has regularly met on Wednesday and Saturday mornings to record as many names as possible of all those buried there. Unfortunately, the original records were lost in the Exeter Blitz and a sad reminder that despite sending them so they would be kept safely, this wasn’t to be the case. As the project has developed and more and more people have become aware of it, the project team have recorded not just the names and the dates but where possible they have added the details of many of the individual’s lives, along with photographs of where they lived and where and what work they undertook. Thus, a living history has been constructed that will provide inspiration for today and for future generations. Copies of the work will be held in St Mary’s Church; Brixham Museum, Brixham Library and Torquay Libraries Local Studies Section. 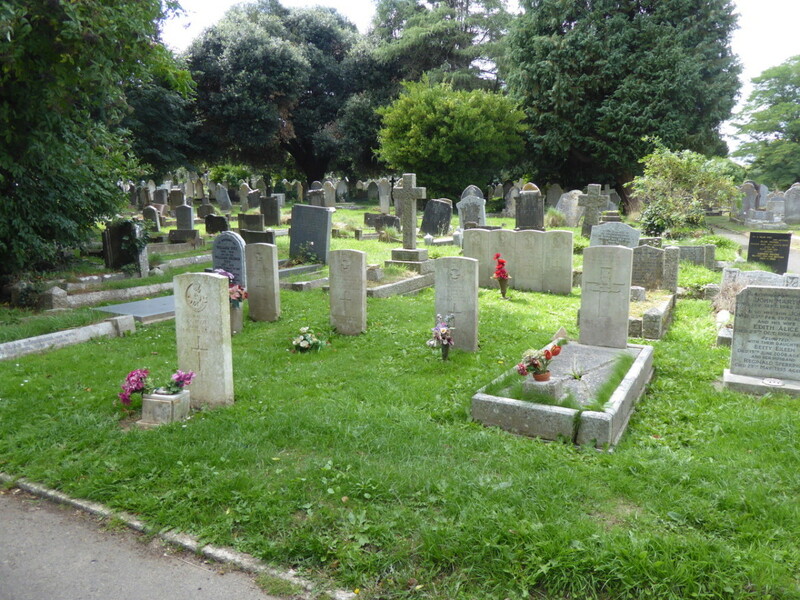 A dedicated website is being created by team members and all project material including a searchable family ‘Commemorative Headstone’ database of the existing graves in St Mary’s churchyard is soon to go online. So far over 9,500 names have been added to the database. Weekly project updates have been posted on social media including Facebook. The project also owes a huge debt to local artist Peter Archer, sadly no longer with us. 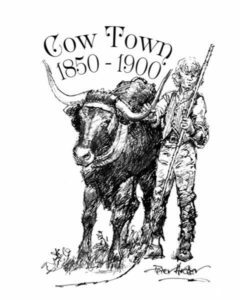 However, before he died, he drew and painted a number of pictures for the project to show what the inhabitants of Cowtown would have looked like and as a result will be a lasting tribute to his wonderful work. Peter’s illustrations also complement the project Primary School Key Stage 1+2 ‘Victorian Britain’ (Brixham) booklet and story-bag. The contents of which include a pair of ‘Workhouse Children’ thanks to Martine Brumwell, a cat and mouse, thanks to Angela Trayhorn plus samples of ‘oakum’ and ‘junk’ old rope unpicked by the workhouse children and then added to tar to waterproof wooded hulls. Churston Grammar School VIth Form Photographic Studies Students have also joined our project team and their photo studies will be displayed in our March 23rd Exhibition in St Mary’s Church. To further illustrate the project, an aerial map has been painted by Dave Brumwell to show the area as it would have looked at the end of the 19thcentury. In addition, a very fine tapestry by Barbara Dawes has been made. 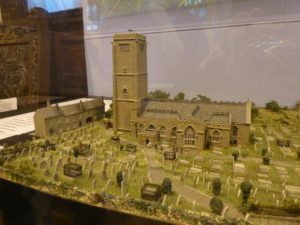 Finally, a scale model of the church and the churchyard has been created by local model maker Paul Bennett to recapture the many features lost through the passage of time. 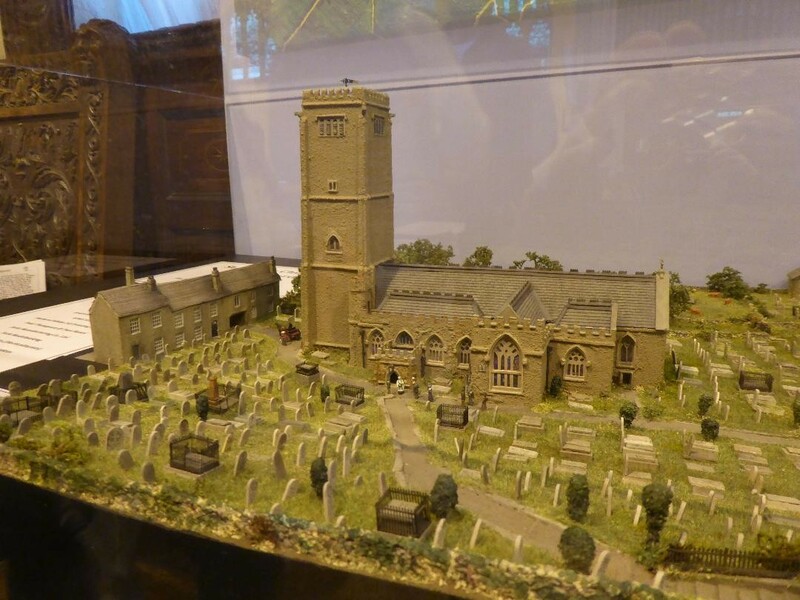 Both the model and painting will be on permanent display in St Mary’s Church from March 23rd. A number of Cowtown family histories have been written and illustrated by team member Jenny Crisp. These have been put on DVD and will form another part of our Key Stage 1+2 ‘Victorian Britain’ (Brixham) educational packs. 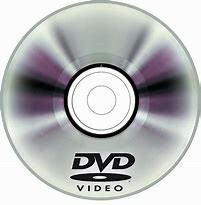 The DVD’s will be streamed on our website. Written by team member and ecologist Nigel Wood an introduction to ‘The Lichens of St Mary’s Graveyard Brixham’ has been written proving that the Graveyard is a living space for wildlife. The guide is in leaflet form and will be available at our exhibition and downloadable from our website. Project member Nina Hannaford has created a series of ‘Cowtown Walks’. These guided/historical walks of the parish will be on display at our exhibition and will be downloadable from our website. Date for your Diary – Saturday 23 March 2019 The project’s climax comes with an exhibition of all of the above work in St Mary’s Church on Saturday 23 March 2019 when project members will be there to tell you about all that has been achieved. Paul Bennet’s scale model is to be unveiled at 2.30pm which opens the exhibition. 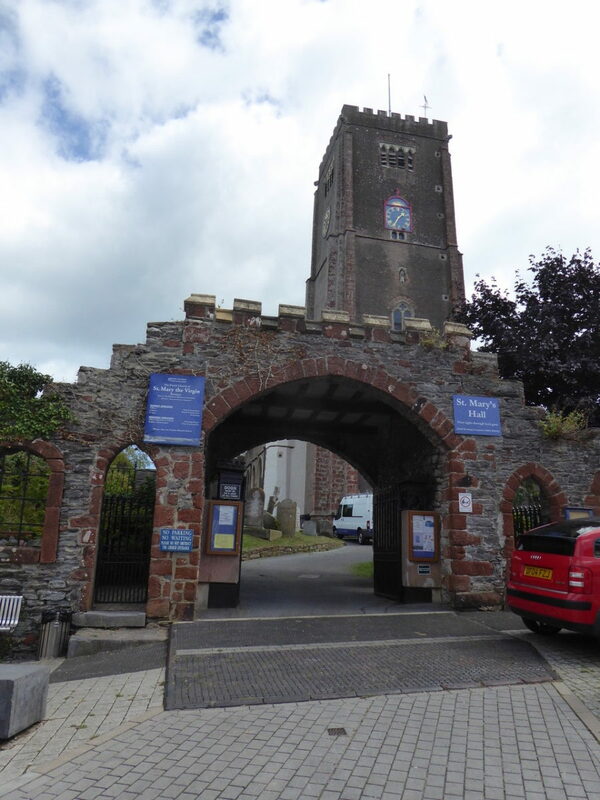 A concert entitled ‘Cowtown in Words and Music’, is being held in the church in the evening, the proceeds of which are being donated to the St Mary’s Church Tower Appeal Fund which is in urgent need of restoration. Doors open at 7pm, tickets will include a ‘glass of wine’ and will be £5 for adults and children have FREE entrance. Performers include Harpin’ Mad, Folk Inspired, Missin’ Tackle Shanty Crew and Friends with ‘Words’ from ‘Victorian Cowtown’ spoken by members of South Devon Players written in part by local playwright David Murphy. As I am sure you will agree, the project has achieved an incredible amount of work which will provide a lasting legacy for people interested in and researching into the history of Cow Town, Brixham. FoBL acknowledges the dedication and enthusiasm of all those involved and my thanks go to all for them for everything they have achieved. For many years now libraries have embraced the need to create their own income, generating funds in a variety of different ways. This can at first seem daunting and alien to those who have worked in local authorities for many years. However, it can also be inspiring, motivational and, once targets are met, can see real returns to each individual library. 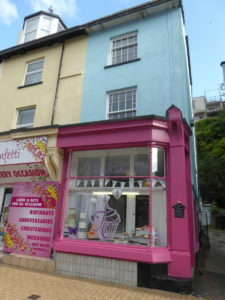 In Brixham, the sale of spectacles, cards as well as seasonal calendars and other offers has almost become part of the furniture. Now the library has a wide range of stationery items for sale at very reasonable and competitive prices. These include fun items for the children as well as something for your office needs. 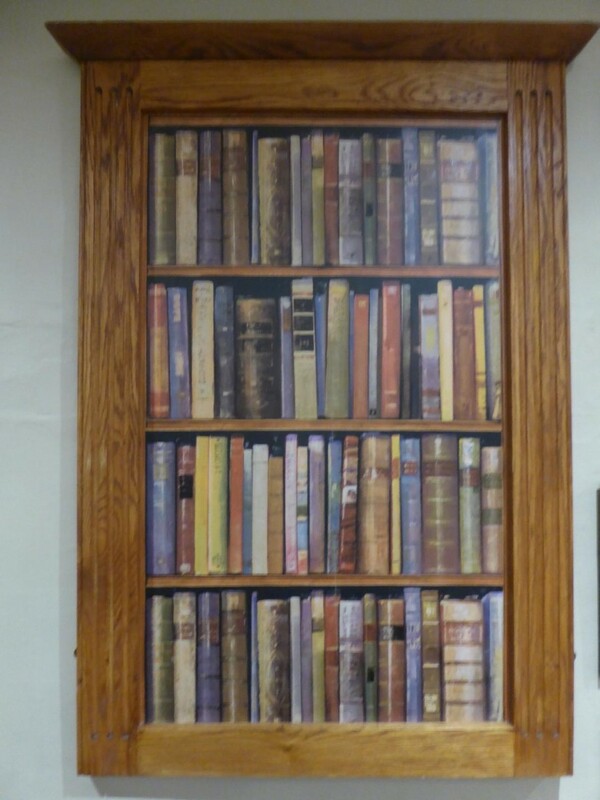 So next time you’re in the library do take a look as you’ll be helping the staff and you may come away with something to tick off your shopping list too. For more information about this, do ask the staff as Emma and her team will be pleased to help you. Our next coffee morning is being held on Friday 5 April between 10.00 – 12.00 noon. We hope to hold a plant sale and any plants you can bring along on the day for sale would be much appreciated. Our last coffee morning raised £161.51 of which £75.00 was raised through the selling of silk flowers that were donated by one of our members. We were also selling jars of marmalade which sold very quickly. All in all, another very successful morning and once again thank you for your continuing support. If you have any similar ideas for future coffee mornings, do talk to us about them. 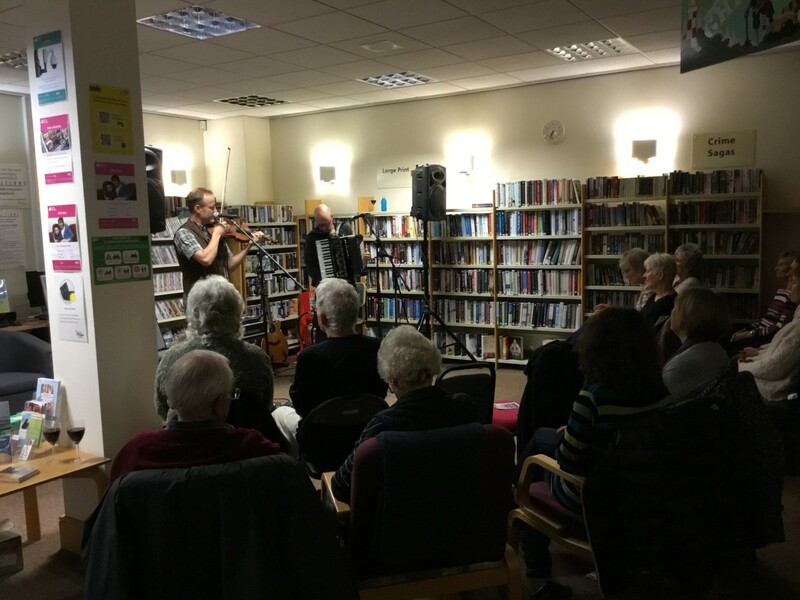 Brixham Library enjoyed a full programme of events and activities in January and were pleased at the take up at many of the events. Our afternoon with Ros Fry & Annabel Coakley from Cancer Research UK went really well raising £32.51 in the retiring collection. Ros wrote ‘Thanks for getting in touch. Great to see the press cutting from Brixham News. We have now visited Honiton, Paignton, Torquay, Churston and Budleigh libraries and the best experience was by far at Brixham! We had far more people than elsewhere and lots more questions! This is clearly due to the promotion you gave it locally. Annie, who runs our local fundraising committee was really pleased to see us and to see the enthusiasm about beating cancer locally. We would love to come again, so do get in touch when you have any thoughts about dates or formats. We can be very flexible and will take your lead as you obviously have your finger on the pulse of what’s going on in Brixham’. It is always nice to receive such lovely comments. We have received the sad news that ‘Liberties Cocktail Bar’ down on the Strand by the harbour have withdrawn from the loyalty card scheme. However, the good news is that ‘Another Chapter’ and ‘The Kitchen Shop’ are still very much part of the scheme and look forward to your custom. Emma has asked me to inform members that discounts are now available for anyone booking tickets in the library for any Fougou Jazz event being held in Churston Golf Club. For details about this please ask the staff or phone 01803 853870. The library holds a very successful Lego Club on a Saturday morning in the Childrens Library. If you know of anyone who has any spare Lego or Duplo looking for a good home then do look no further as new donations are always welcome. A great result and lovely to see so many people on the day. Our next coffee morning is on Friday 1 March between 10.00 – 12.00 noon. One of our members will be selling arrangements of silk flowers in aid of FoBL funds and a sample of those available for purchase can be seen above. Another Friend is busy making marmalade and has offered her produce to sell at the Coffee Mornings, however she does need some more jam jars. If you have any spare please bring them into the Library and we will pass them on. First of all, welcome to 2019 and a Happy New Year to everyone. Like all the libraries in the Bay, Brixham Library starts its year with a flourish with our new events programme, printed copies of which are available from the library. 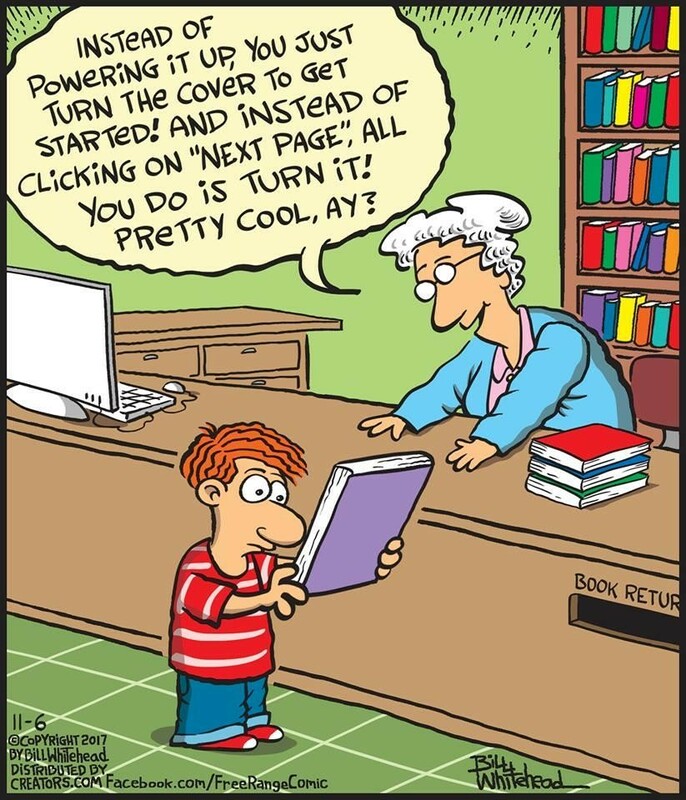 If you can’t find one when you next visit do ask the library staff and they’ll make sure you get one. As usual there are lots of ideas for you to follow up and to avoid any disappointment do book a place on anything that interests you. 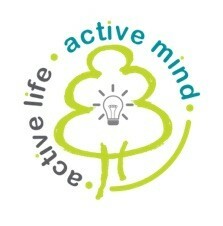 Active Life Active Mind is an annual programme of library events focused on health and wellbeing. 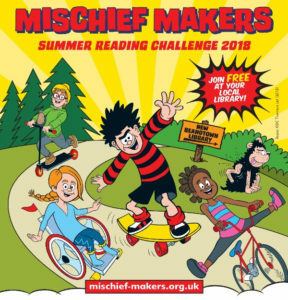 All the four libraries in Torbay are participating in this programme this year and an information leaflet can be obtained from Brixham Library next time you visit. Many of you must have been out and about on Friday 4 January in an effort to get rid of those post-Christmas blues. It was lovely to see so many people at the coffee morning and we raised £120 towards FoBL funds. To help with the making of hot drinks, the decision has been made to purchase a small microwave so that it will be longer necessary to borrow the library staff microwave from upstairs each month. Our next coffee morning is being held on Friday 1 February when we plan to have another scarf sale. Any unwanted scarves can be dropped off in the library before the day. All that we ask is they arrive clean and neatly folded please. 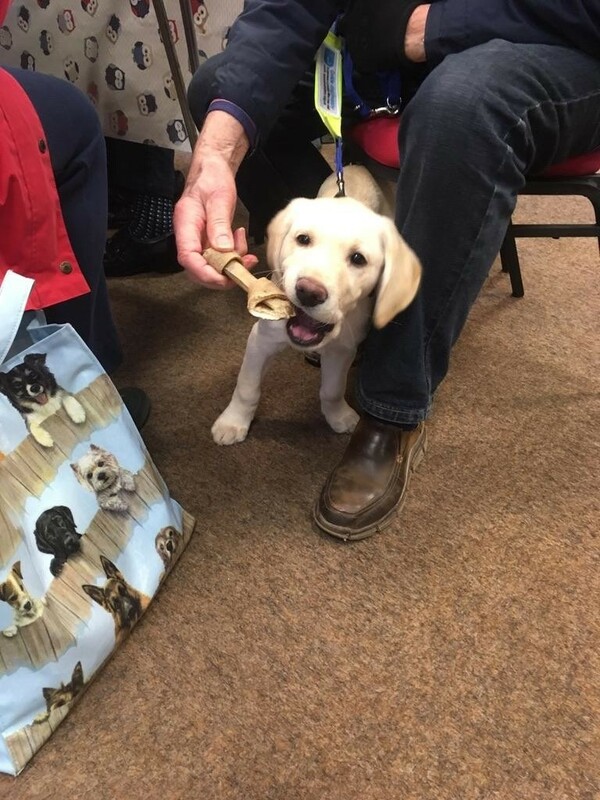 Our new friend to the Friday Coffee morning is only 12 weeks old and is training to be a guide dog for the blind. This was his first visit to the library and a lesson in trying not to react to all the people around him. I suspect that many hearts broke when they saw him!!! 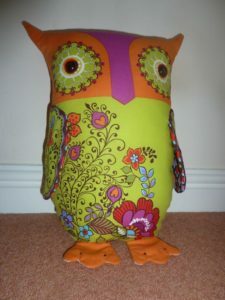 One of our members has made a very attractive owl which we hope to raffle that morning. Should you wish to see it before the day we hope to have it on display during the week of the coffee morning. Our Monday morning and Tuesday afternoon health walks continue to take place weekly and we have been very pleased with the numbers joining these walks. It has been mentioned to me that some are concerned about walking along the coastal path (Monday Walk) which can be very muddy at this time of year. Anyone who is apprehensive may use the alternative footpath route which doesn’t present the hazards of stiles and muddy feet. Whichever route you chose, all are welcome even if you only decide to join us for a cup of coffee in The Berry Head Hotel at 11.00am. The meeting place for the Monday walk is in Gillard Road at the back of the Douglas House Cheshire Home at 10.00am and on Tuesdays at 2.30pm by the Old Fish Market down by the harbour. 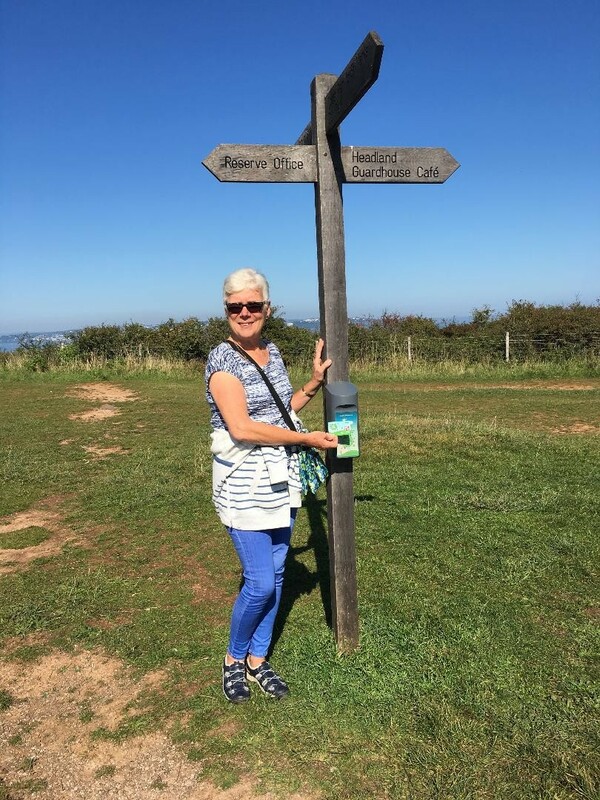 Take-up for the fortnightly dementia friendly walks has been slow but those who have joined us with their carers have enjoyed themselves. We take the walk as slowly as those who come along want to and try and finish for a cup of coffee at the end of the walk. Our normal coffee stop is the Chart Room, Brixham’s First Class Coffee Lounge, but as this is closed during January for refurbishment, we’ll find a suitable alternative until it reopens on the 28thof this month. Or e-mail aca14@btinternet.comheaded FoBL Newsletter Competition. Please submit your entries by Thursday 28 February. If you are booking theatre tickets do book them through Brixham Library and avoid a booking fee. 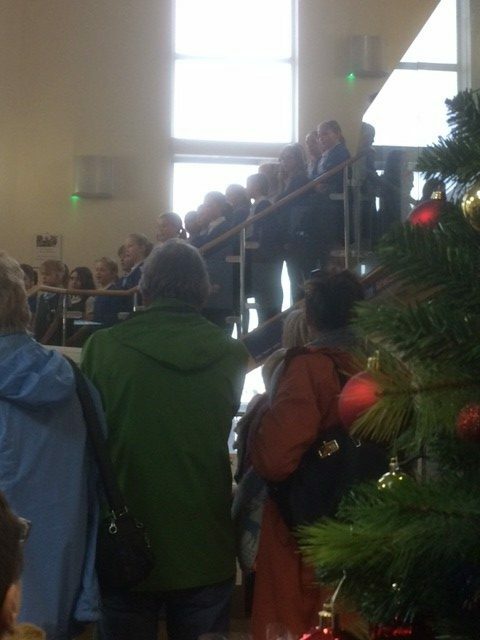 The December Friday Coffee morning was given over to celebrating 25 years since the Library moved into its current building. Almost 60 people arrived to drink coffee, talk to each other, listen to Furzeham School sing Christmas carols, and – of course – to eat cake. The event raised £168.40. A great way to start the festive season. 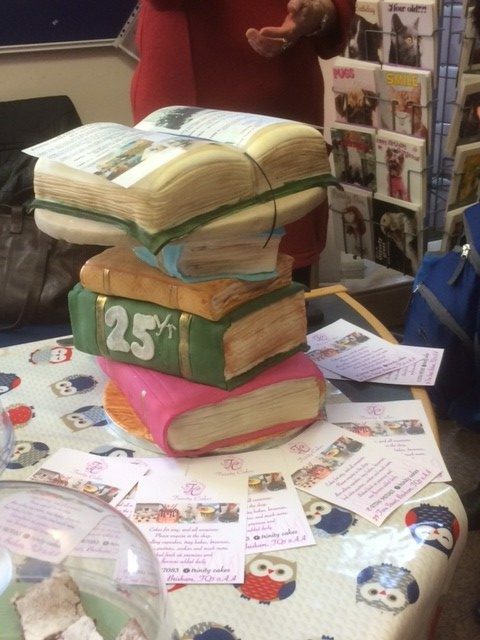 Many thanks and much admiration has to go to the artistry of Trinity Cakes, Brixham – the birthday book cake was a real showstopper! As we count down to the festive season this is an opportunity to reflect on the busy autumn that the Friends have had both with new and on-going activities and events. It is also an opportunity to welcome the positive approach being taken by Libraries Unlimited towards Brixham Library as it introduces its own programme of events and income generation activities. We look forward to working alongside them so that in the coming year we have a fully integrated programme with something to appeal to everyone. This continues to be supported by you all with our coffee morning in October being devoted to the Macmillan Cancer Charity as so many have us have been touched or know people who have been affected by cancer at one time or another. 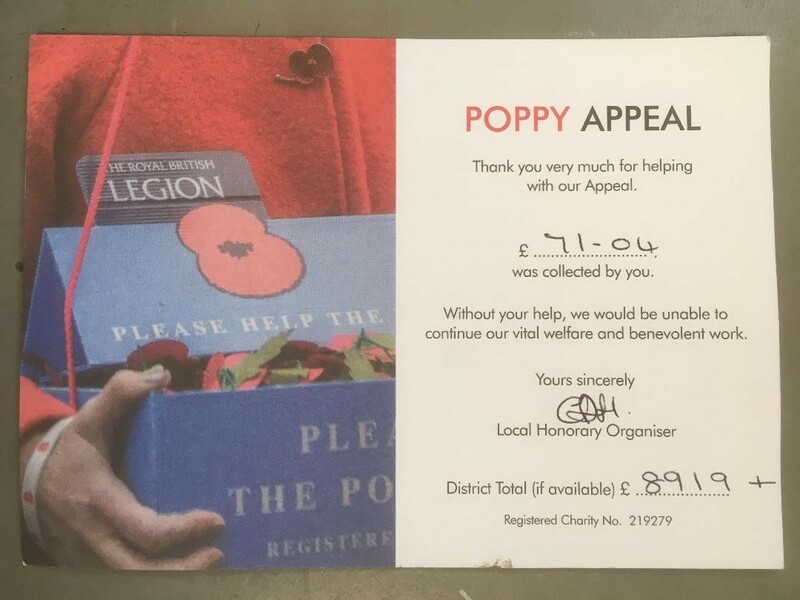 In November, we thought about the ending of WWI and supported the British Legion in the good work that they continue to do year on year raising £71.04 with the selling of knitted and felted poppies. Thank you to all those who supported us on these days. In December we take the opportunity to celebrate the library being in its present building for 25 years and a special cake is being made for the occasion. So why not come along on Friday 7 December between 10.00 and 12.00 noon and join us. Along with coffee and cake, we will have an array of different items for sale and with Christmas just around the corner you may well find the odd gift or two to help lessen your long list of things to do. In addition, children from one of the local schools will be joining us for a short musical interlude. Finally, our ‘coins in the jar’ scheme has been adopted by many of you and last month a total of £32.51 was handed in which is very much appreciated. 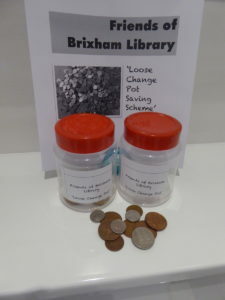 So, if you haven’t thought about doing so please and would like a jar for some or all of your spare change do ask for one next time you are at a coffee morning or visiting the library. This ended on 31 October and I can reveal that for those friends who joined the FoBL team we may not have been near the top of the leader board but our average no of points per team member was very favourable with other teams. I know that those who took part had a great deal of fun and that is what it was all about, as well as enjoying a good walk, run or bike ride as well. Our retail partners are all gearing up for the Christmas period and a busy time for them all. Please do take advantage of the many offers they are making available though our joint loyalty card scheme with them helping you to save some pennies and them to continue to trade successfully in the town. I am often asked what benefit the scheme brings to FoBL. 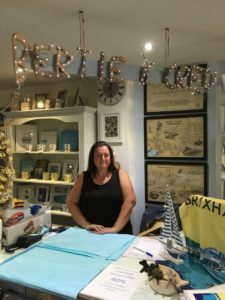 Our inspiration comes from the fact that the more people are lured into Brixham to shop then hopefully they will take the opportunity to use the library as well. Thus, everyone is a winner and the offers made to FoBL members are purely a bonus and hopefully something that you all value too. Three Billboards Outside Ebbing, Missouri and many more. So, with the winter months on our doorstep, evenings drawing in, why not make the most of your membership entitlements and settle down with a free DVD. Alternatively, if children and grandchildren need settling down quietly for a spell there are many DVD’s catering for the wide tastes of children and young people too. 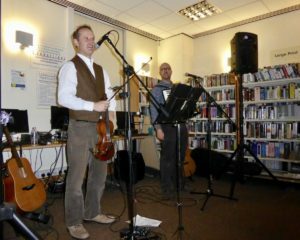 On Friday night, Brixham Library by popular request saw the return of local folk duo Mike Cosgrave & Steve Banks. Since their previous visit in 2016, the two lads have continued to develop and refine their wonderful repertoire of music and song, drawing from far and wide across the UK and Europe. They have been described as ‘one of Devon’s multi-instrumental treasures’ and a very apt description as they played through their melodic and captivating musical journey with a totally captivating and magical evening. Organised by The Friends of Brixham Library this was a very successful fund-raising evening raising over £200. Request for empty cereal boxes and plastic lemonade bottles: this has come from Emma who would like to stock pile them for future children’s craft activities. Please take them into the library and give to the staff at the desk. 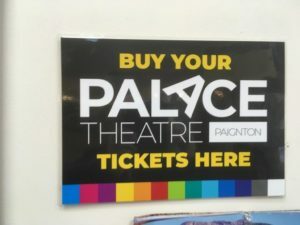 Brixham Library are trialling the taking of bookings for tickets for the Palace Theatre, Paignton. This will avoid any booking charges being made and with the addition of a meal deal in the nearby Peaky Blinders Restaurant with the downloading of a voucher will enable a 10% voucher to be available. Please ask for more information about this in the library. It was recently drawn to my attention that our library was beginning to look like the ‘Lost Gardens of Babylon’. I am pleased to say that shortly after bringing this to the attention of Torbay Council they have now been cleared and as a result look a lot better for it. Protect library services by ringfencing government funding for libraries. 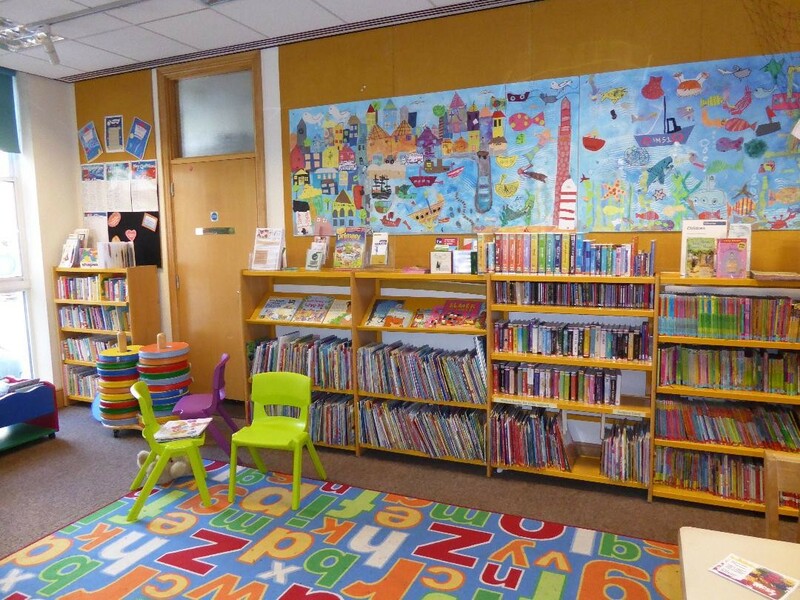 The Government takes seriously the statutory duty to superintend and promote the improvement of library services in England – to ensure that councils in England meet their own statutory duty to provide a comprehensive and efficient library service. The Government is committed to supporting a sustainable long-term future for public libraries in England. We want libraries to be resilient and equipped to meet local challenges – to thrive, not just survive. We are continually advocating for their value and contribution to strategic objectives across central government. The Department for Digital, Culture, Media & Sport (DCMS) and the Local Government Association (LGA) established the Libraries Taskforce in 2015DCMS provides funding of £500,000 a year (from April 2016 to March 2020) to enable the delivery of its work. 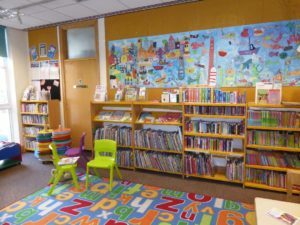 The Taskforce is helping to invigorate the public libraries sector by advocating for public libraries with central and local government, encouraging good practice and innovation, and by providing toolkits and free masterclasses for library services. Over the five-year period from 2015-16 to 2019-20 councils will have access to more than £200 billion. The Chancellor’s announcement at budget means a real-terms increase in funding for local government in 2018/19 and 2019/20. The Government’s position is that local government funding should be non-ringfenced. This has been a long-established Government principle based on the premise that giving greater funding flexibility to local authorities supports them to make spending decisions based on their local needs and priorities. Removing ringfencing also supports good, efficient financial management at a local level and promotes the government’s agenda of localism. 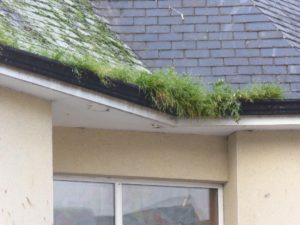 Local Government funding is provided through the Local Government Finance Settlement with a certain sum of money based on the assessment of local needs. The decision about how to allocate this falls to the local authorities as the locally democratic and accountable body. Ultimately, decisions about resource prioritisation for libraries sit with local authorities. The Petitions Committee will take a look at this petition and its response. They can press the government for action and gather evidence. If this petition reaches 100,000 signatures, the Committee will consider it for a debate. The following extract is taken from the October edition of the ‘Mature Times’ (Issue No. 314 page 3) and although written with National Libraries week in mind still worthy of bringing to your notice. Welcome to our autumn newsletter and no surprises that we have a number of topics to bring to your attention. 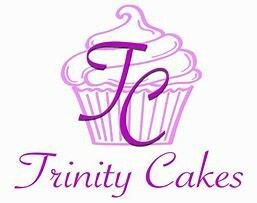 We welcome Karen Johnson of ‘Trinity Cakes’ to the scheme. 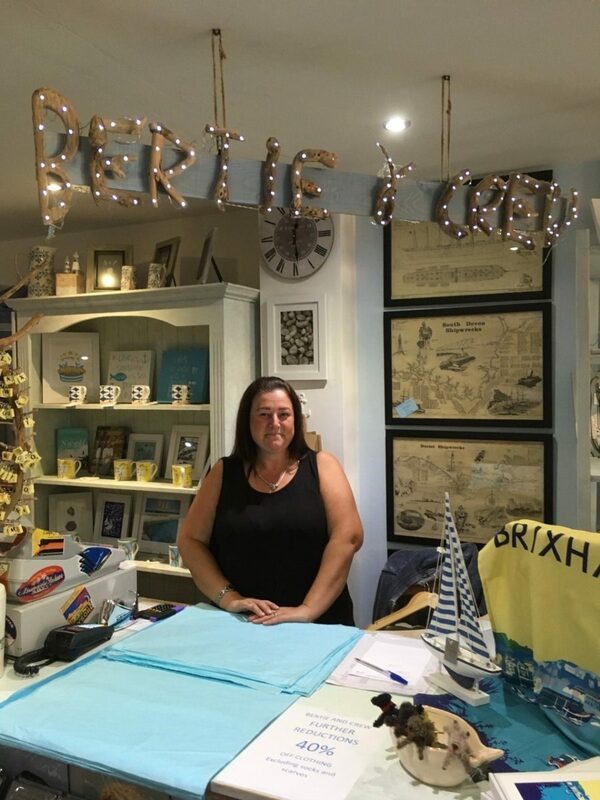 Karen’s business is a well-established Brixham firm but has only recently moved into her Fore Street premises that for many years was a sweet shop. Karen is offering a 10% discount on any celebration cake ordered by FoBL members. 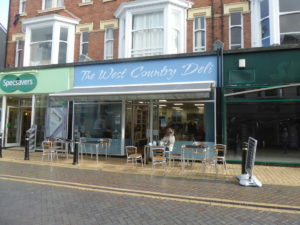 We are also pleased to confirm that following the change of ownership of ‘The West Country Deli’, their new owners Angela, Graham & Anna Mosey will be continuing to offer FoBL members a 10% discount on all purchases. 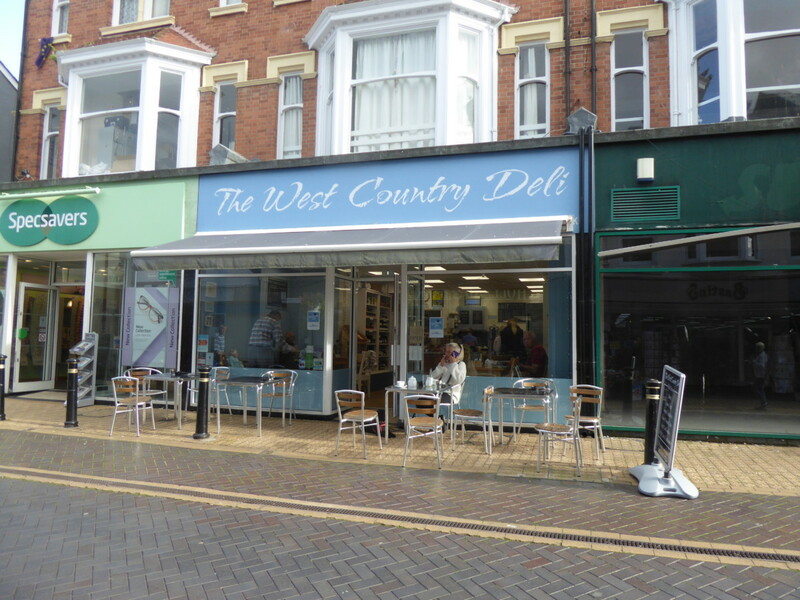 This is an opportunity to formally thank Mark Chopin the previous owner for all his support whilst at the Deli’s helm and we wish him continuing success in his other business ‘Twitt Twoo’ in Union Lane who also participate in the scheme. Denise from ‘Taste’ in Middle Street has confirmed that she is no longer able to offer a 10% discount on alcohol sales as this would make her sales of certain brands unviable to stock. However, concessions still apply to all her other products. So, if you haven’t called in yet do go and have a nose as you will be pleasantly surprised. As we’ve said before, these offers are only available to current FoBL members and membership cards must be shown to retailers to claim a favoured discount or concession. 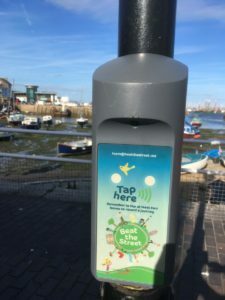 You may have noticed that small boxes have appeared around the town in various places and these can also be found right across the bay. 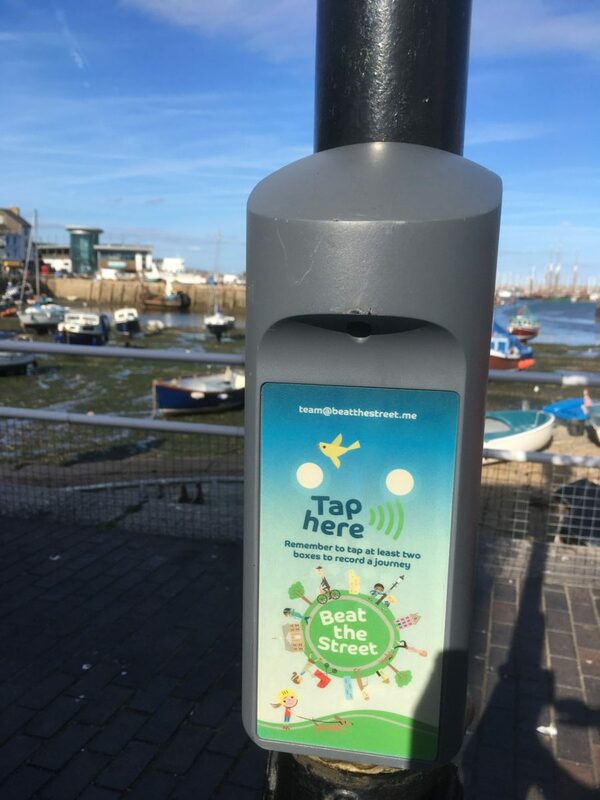 Delivered by Intelligent Health on behalf of Sport England and Torbay Council, this scheme running until the end of this month is to encourage people of all ages to walk, cycle or run for fun. 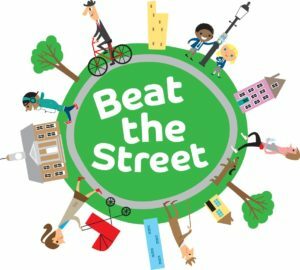 Thus, ‘Beat the Street’ is turning Torbay into a giant game with opportunities to win prizes and discover more about the area. Information leaflets which contain a map of all the beat Boxes and cards so that you can register online are available from Brixham Library and when joining one of the teams you might want to consider signing up for ‘The Friends of Brixham Library’ team. There is no doubt that this is just a fun thing to do and having tried it myself whether with friends or family or both, it’s worth giving it a try. Whilst FoBL tends not be political there is a national campaign being run at present which may be interest to some of you. 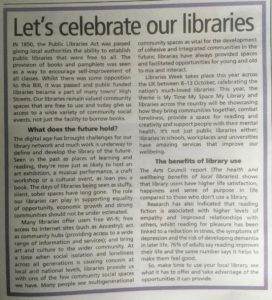 It is often forgotten that the provision of our public library service is because local authorities by law must make provision as it is a statutory service. 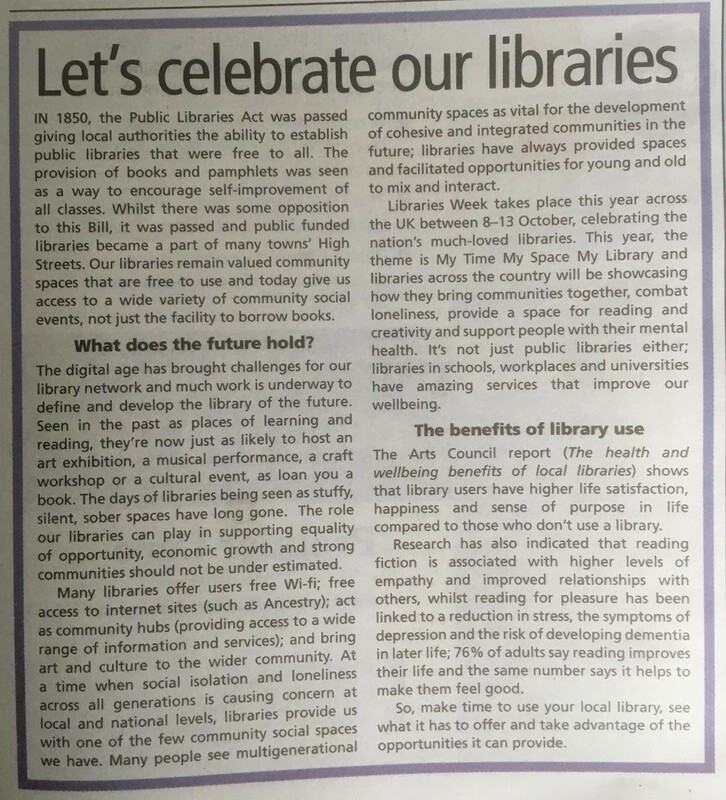 Hence, the link below and I would urge everyone to take a moment to consider the proposal because if implemented such funding could make a huge difference to the security of library services being offered right across the country. Libraries across the country are being closed, cut back and/or outsourced to volunteers as a result of government cuts to local authority budgets. Councils are unable to keep staffed library services open when faced with the competing demands of social care, child protection etc. Local libraries are a vital resource for the promotion of reading, literature and culture. They are a necessity for the digitally excluded who need to go online to access benefits, health, education and employment resources. While the commitment of volunteers is welcomed, volunteer-run library services are unsustainable long-term. The government must ringfence funding to ensure councils can fulfil their statutory duty to keep libraries services available to the general public. As mentioned in the last newsletter we are actively putting together a programme for next year and our thanks must go to Emma in Brixham Library who is busy beavering away on much of the detail at present. This evening event is being put on by Libraries Unlimited on Friday 9 November. Doors open at 7.00 for a prompt 7.30 start. A bar will be available, and teams can enter of up to six people at £2.00 per person. However, please don’t worry if you are not part of a team as teams can be put together on the night. To ensure you or your team have a place or if you require more information please ask the Brixham Library staff or tel: 01803 853870. Back by popular demand, this local duo is a joy to listen to and a magical evening is promised. Tickets are now available from Brixham Library and selling fast – £10.00 FoBL members and £12.00 to non-FoBL members. Each ticket includes a free drink on entry. Tuesday 26 February from 7.00pm ‘Idle Women of the Wartime Waterways’ will be appearing in Brixham Library. Written and performed by Heather Wastie & Kate Saffin, this will be their first visit to Torbay and the West Country with this production. In a double bill of theatre, story, poetry and music they whisk you back to the days of WWII when a shortage of crews to keep the working boats brought a new breed of boater to the canals of England. Young women took on the challenge and this is their story. So please pencil the date in your diary and as soon as tickets go on sale we will be reminding you of what promises to be an evening to remember. Many thanks for all those who supported our Macmillan Coffee Morning on 5 October. £205 was raised, which is a fantastic result. The Library was certainly buzzing this morning, and we hope everyone who was able to come had a fun morning. Mike O’Donnell won the ‘Stick the Cherry on top of the Cake’ game, and Wendy Coote won the ‘Guess the Weight of the Cake’. Once again many thanks to all who contributed, especially Chris and her team who probably had their busiest 1st Friday yet! Our November coffee morning on Friday 2nd November between 10.00am – 12.00 noon has two themes to the morning. Being so near to Remembrance Day, we will be selling poppies in aid of the British Legion. Izzie Lomas will be coming along with her carefully crafted poppies and a number of friends have been busy making poppies and all poppy proceeds will be given to the British Legion. 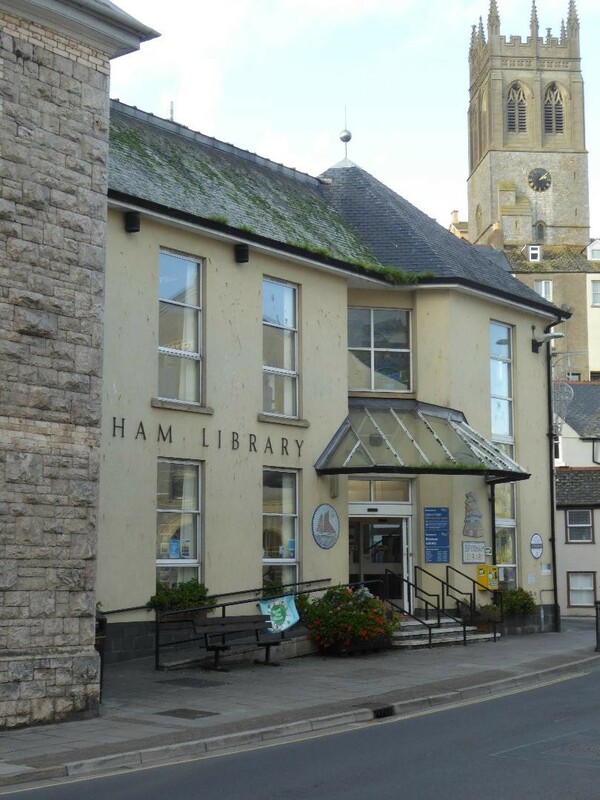 Our December coffee morning, December 7th, will celebrate 25 years since Brixham Library officially opened in its current premises. Over this period there have been many changes, but the library still looks as good as it did then. However, whilst not quite unique, our library in Brixham was very fortunate in that for many years staffing remained fairly constant. Thus, those familiar faces are still with us at our monthly coffee mornings for it was those individuals who were inspired to set up our coffee mornings which we all enjoy so much. Come and join the birthday celebrations. The Library staff have asked me to remind you that its National Libraries Week next week, and as part of the celebration they are hosting a coffee morning in the Library next Wednesday. Once more some of the ex staff will be there and yet more homemade cakes to enjoy! ‘With so many new books being published every month, choosing a new book to read can be somewhat bewildering. Just identifying what genre you’re interested in can be problematic; books are not always so easily pigeon-holed. So, there you have it. 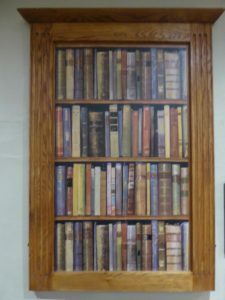 Whether you read to learn, study or just for fun, our library is an open doorway into a literary world and if what you are looking for isn’t there, Emma and her team of Helen, Sarah and Sue will be very pleased to help you. Don’t forget your current FoBL membership card entitles you to some free reservations. 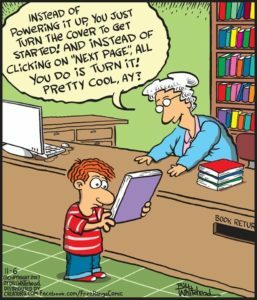 Happy reading…. *Mature Times – free copies of this regular publication are available from the library. Our first attempt at a Skittles Evening on September 21st went down very well. Big thanks to all who supported the evening, to the staff at The Skipper, and an especial thanks goes to Richard Brown for keeping us on the straight and narrow! We raised £70.11 for FoBL funds and, just as importantly, everyone had a fun evening. Those who attended John’s talk on the 19thSeptember enjoyed a very interesting insight into the lives of the Lord of the Manor of Cockington Court and his family during the 1870s. It gave a different view of the lives of all sections of society at that time. Many thanks to John for once more supporting the Friends with such an illuminating talk. We’d just like to remind you of the FoBL Coffee Morning to be held on the 5th October from 10.00 to 12.00 at the Library. This month we are supporting the Macmillan World’s Biggest Coffee Morning. Please come along and bring your friends to support such a good cause – and take your chances at sticking the cherry on the cake or the guess the weight competitions. The list is now open for the free Half Term Children’s activities. These have been very popular in the past so please put names down early so as not to be disappointed. Tickets are now on sale for our Autumn Concert with Cosgrave and Banks. Their last concert in 2016 was a sell out and we have had many requests for their return. Please book early for your chance to experience these exceptional musicians. Admission includes a free drink! August was a busy month for FoBL often behind the scenes. 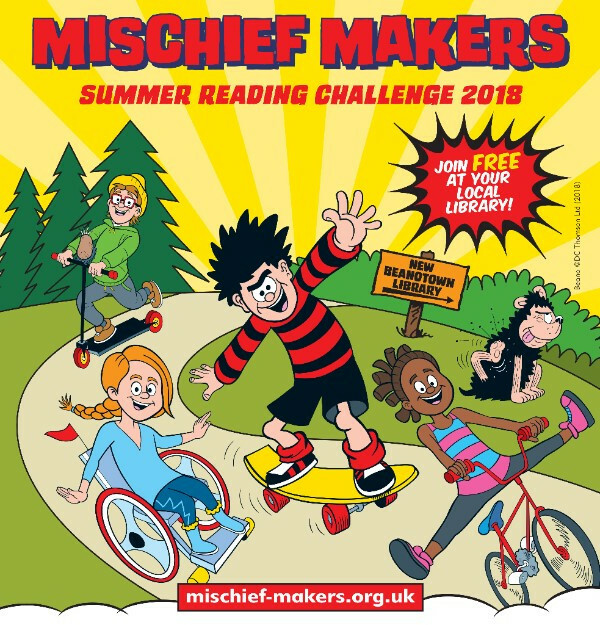 With holidays in full swing, this was an opportunity for FoBL to sponsor a number of holiday activities for children and young people ensuring that our library was not forgotten during the fine summer weather. Whilst great progress was made in producing the first throw, sadly it is to be the last in this project. Despite several volunteers being inspired by Marion Wood’s idea the project has been put on hold for the present. However, the good news is that the finished item will be made available in the near future – possibly through holding a special raffle or auction at one of our Autumn Friday coffee mornings. On behalf of all FOBL members our thanks go to Marion and her eight crafters for all they have achieved. 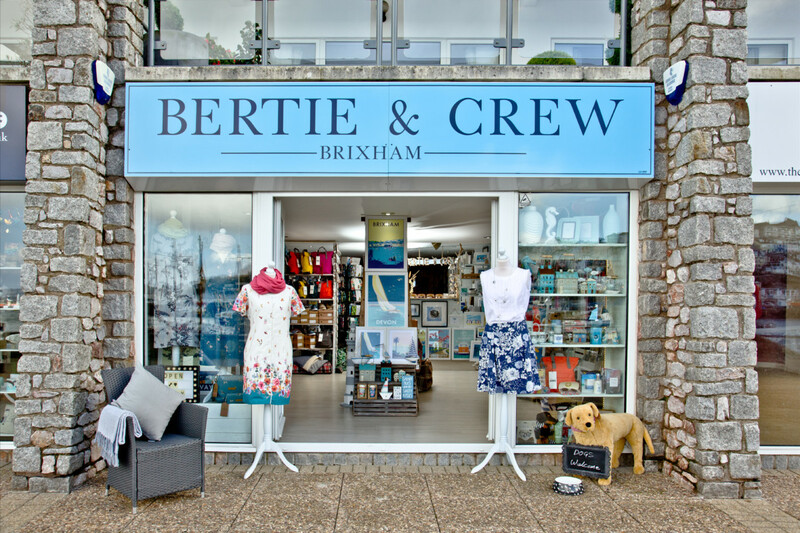 Many of you will know that the owners of Bertie & Crew, Nicola & Charlie have finally sold their business, keys changing hands last week. We wish them both the very best for the future. 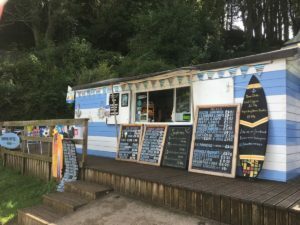 The new owners Leanne & Tim Jones allowed themselves a mere morning to effect some minor changes before opening again. 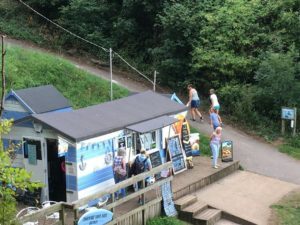 So, it’s business as usual and I’m pleased to confirm that the shop will continue to be part of our loyalty card scheme offering a 10% discount to current FoBL members. 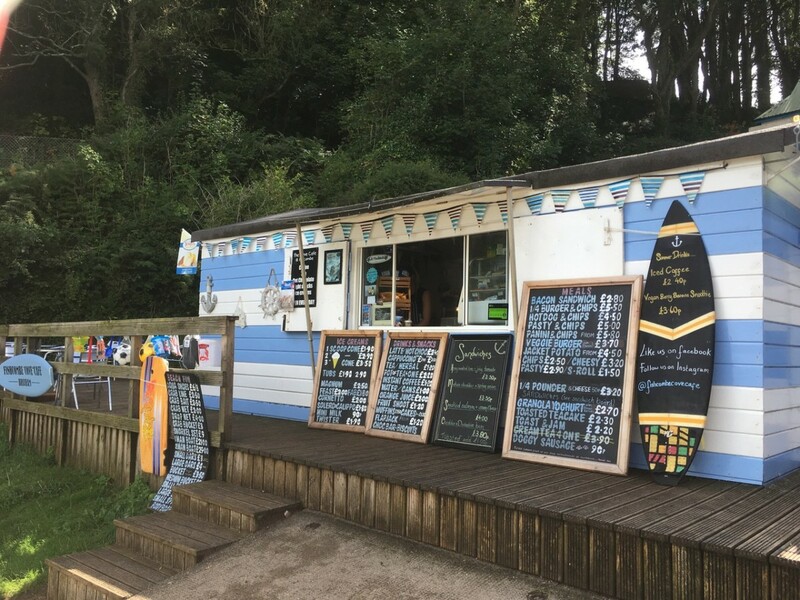 We also welcome the Chloe Pavely at the Fishcombe Cove Café to the scheme. 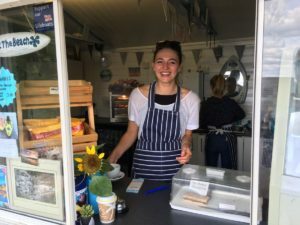 Chloe took over the business only weeks ago and has great ideas which she hopes to roll out over the coming months. 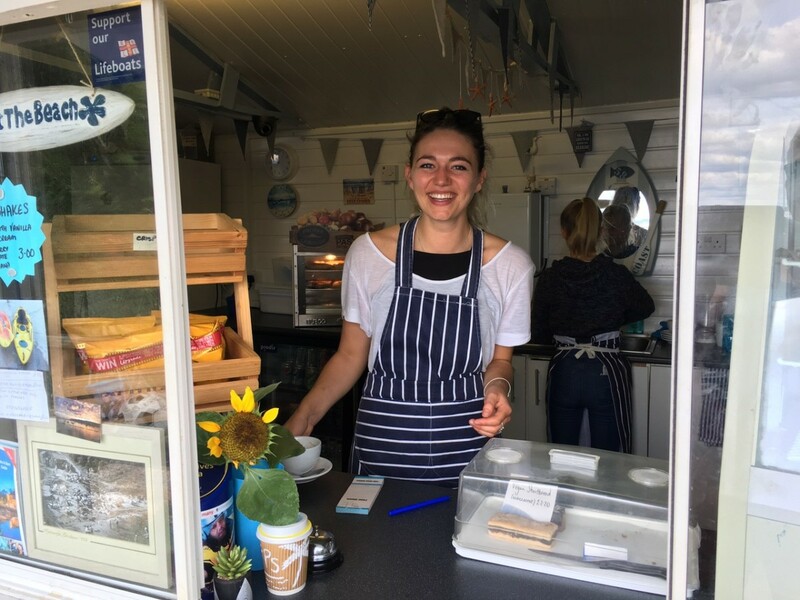 So, whether you are taking a stroll through Battery Gardens or walking the Coastal Path, be sure to stop by for a cuppa and perhaps a snack as the view from the café terrace is just delightful. Chloe will make you feel very welcome and is keen to offer all FoBL members 10% off if you spend £5.00 and over. This is a reminder to all members that those retail outlets participating in the loyalty card scheme do this on a voluntary basis and the concessionary offer to members is their kind offer. Such offers are only available to FoBL members with a current membership card and these must be produced at the time of any purchase to avoid any embarrassment or misunderstandings. Your help in doing this would be much appreciated. In the heart of Higher Brixham lies St Mary’s Church, a site that has overlooked both ‘Cow Town’ & latterly ‘Fish Town’ for hundreds of years. Over the last 18 months a group of people have been regularly meeting in the church yard to record all the names on the gravestones to once again have, as near as is possible a complete record of those who lie there. The original records were lost in the Exeter Blitz and although over the years some of the work has been accomplished, nothing to date has been done on this scale before. In this oasis of quiet, just yards away from the hustle and bustle of St Mary’s Square, it is so easy to reflect on the lives of those who are buried there. For over the years, history reveals itself behind those names, many of them so familiar and still heard today within the town. 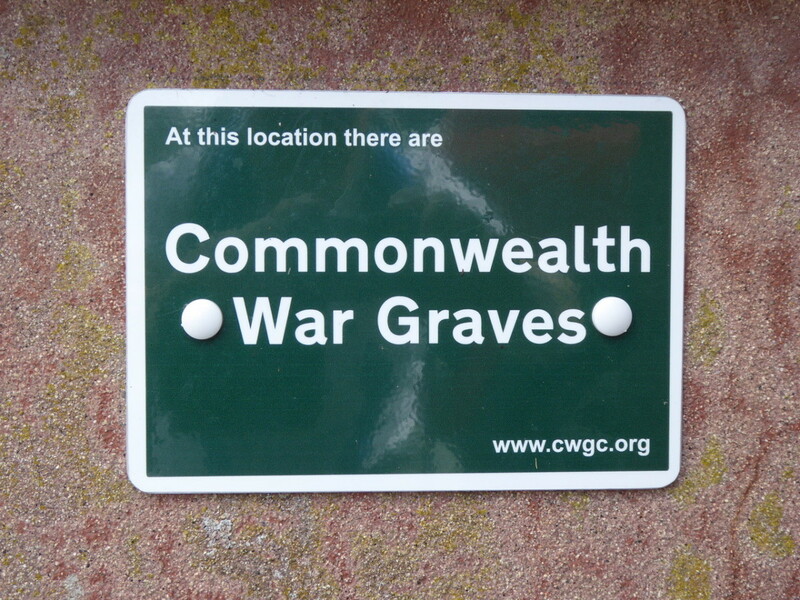 As a result of the project a new Commonwealth War Graves sign can be found in the main entrance to the churchyard signposting those who should never be forgotten. 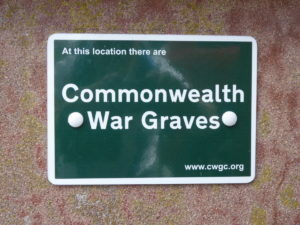 I have to confess that like many a visitor I had no idea that there were some war graves in the church yard, one dating back to 1919 and the remaining eight graves from WW2. If you have an interest in the above lottery funded project ‘St Mary’s Church Yard – Cow Town 1850-1900’, please contact the project co-ordinator Phil Trayhorn tel: 01803 752239. Help is now required to verify and confirm the details on the records that have already been compiled. If you have any knowledge or information about family or people buried there that can be added to the information already collated, you will be welcome with open arms. Alternatively, why not go along on a Wednesday or a Saturday morning and make yourself known. 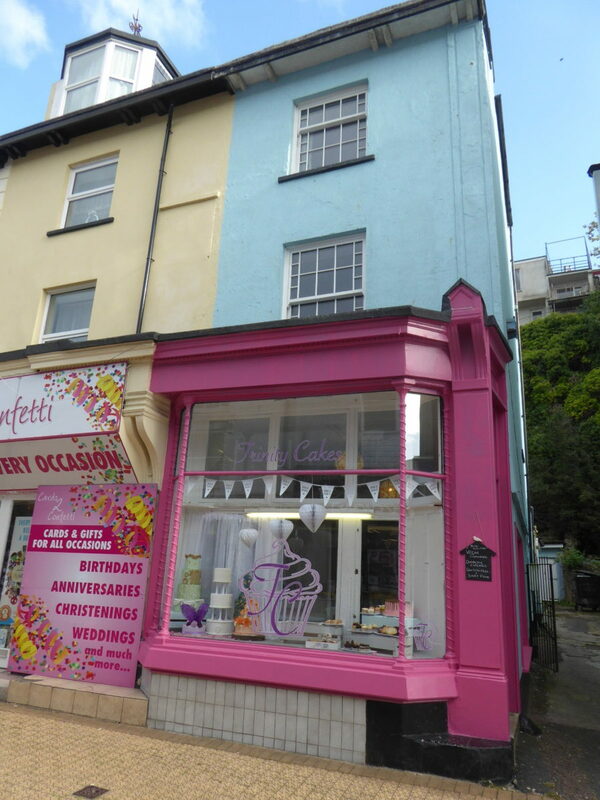 The project is also putting on an exhibition ‘Cow Town Victorian Higher Brixham’, to be found on the Ledge in the library from Friday 25 August to Friday 28 September. Busy hands have been very active as they applied themselves to a project inspired by Laura Scott from ‘The Sewing Room’ to produce a splendid banner . Just a reminder that our next ‘First Friday of the Month Coffee Mornings’ is on Friday 7 September between 10-00 – 12.00 noon. We have been really pleased with all the support you have shown, and this really is an opportunity to meet with friends, make new ones and or enjoy a cuppa with perhaps a slice of cake too. At the next coffee morning there will also be a sale of prints which could make ideal small gifts or presents with the festive period looming in the distance. At the last coffee morning we were giving away jars for small change. We know that many of you already collect for other charities and good causes in this way but every little helps, and it is such an easy way to find a home for unwanted small change. Therefore, if you would like one, do ask at the coffee morning. If your jar is already full – bring it back and we shall be delighted to empty it for you! For further details for any of the above or to book a place please visit Brixham Library or tel: 01803 853870. As we look towards the coming of autumn, this is also the time when we start thinking about our events programme for next year. If you have any ideas of any activities or events that you have enjoyed in the past either with either FoBL or with other organisations and would like to see in our programme do let us have as much information as you can so that we can consider them for inclusion. All ideas should be handed into the library FAO, Alasdair Anderson (Events Programme Ideas 2019) and we will do our best to see how they can be incorporated. We are also looking into the possibility of holding evening events in the library, something we have wanted to do for a long time but felt unable to do because of the cost of paying for a member of staff to be in the building. With the permission of ‘Libraries Unlimited’ this may not now be necessary and could enable many new opportunities to be created. Secondly, if you would like to contribute to our newsletter, any contributions would be much appreciated as it would be even better if it reflected the news and views of the wider membership. Finally, we are always looking for fund raising ideas. With everyone doing just this, if you know of a good idea that would help FoBL and even better if you would like to try an idea out for us do let us know. Are you 50 or over? Come and join us FREE Sewing Banner Sessions Every Monday in August. 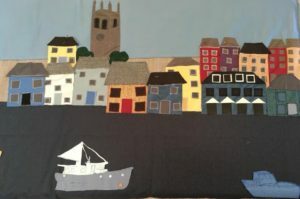 There will be free creative embroidery sessions running in Brixham, Churston and Paignton libraries during August only, as this is a short term project. 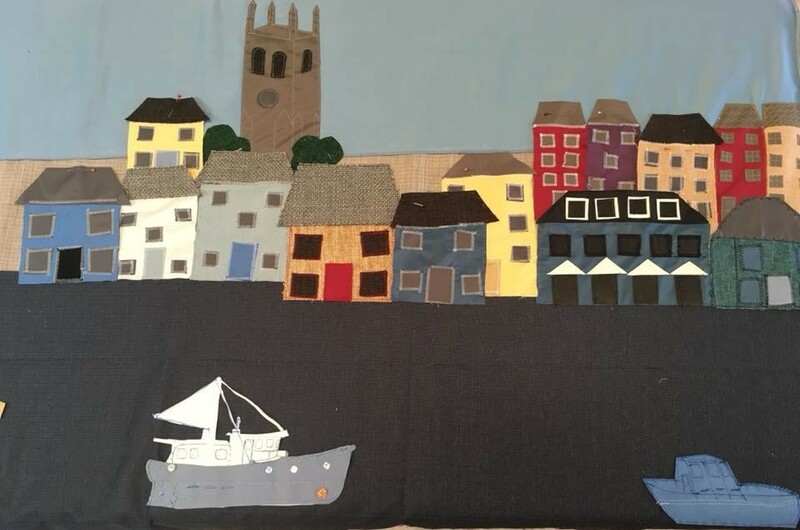 A warm welcome awaits & an inspiring morning where you will connect, make friends and do some mindful sewing with our Sew Fab Community Banner project in Brixham Library. No experience required. Sponsors of the sessions include the Design Council, Transforming Ageing, UnLtd, the Big Lottery Fund and Torbay Community Development Trust. The organiser, Laura Scott from The Sewing Rooms, is providing help and instruction for the community to come together and create this project whilst making friends with others. The finished panels will be joined together for exhibition in Paignton library before being separated to be exhibited in Brixham, Paignton and Torquay locations.